The Avanti Mentor 845 is fine airgun for new shooters! The Avanti Mentor 845 is a single-stroke pneumatic, which means it requires just one pump stroke to power the gun. The airgun is sized for shooters 10 and older (we use them in our camps and Jr. teams for 7 - 11 year old's it fits them fine adult supervision required) to learn to shoot in 10-meter competition, and easy one pumping effort is geared toward younger shooters. This does not come with a or even offered with a sling bracket from Daisy. Max velocity 300 fps pellet .177. The classic Junior competition rifle! 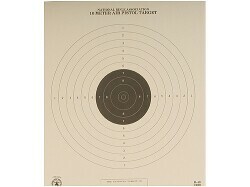 Ideal for Jr. shooters (with adult supervision) to learn to shoot in 10-meter competition. Daisy's Avanti 853 Legend has a sporter hardwood stock that's capped with a removable buttpad to allow for the insert spacers (not included) to adjust the length of pull for the shooter's size. Most impressive is the crowned Lothar Walther barrel. It's precision-bored for .177 match pellets, has 12 lands and grooves, and a right-hand twist. The front sight has interchangeable aperture inserts, and the rear sight is micrometer adjustable. The sling (not included) will also help the shooter steady the rifle. The 853 Legend is so accurate that most shooters will not outgrow the rifle's potential. Although official competition rules do not allow scopes, the rifle has a dovetail scope mount in the diecast receiver in the event you want to use this rifle for shooting other targets or just for fun. * Adjustable buttpad stretches rifle's length from 38.75" to 41.75"
The Crosman Silhouette PCP pistol meets the requirements for competition under the rules of the NRA and the International Handgun Metallic Silhouette Association (IHMSA). Note: Only for models that have been modified with the AS2250-013 receiver kit. Including pistol models 1740, 2240 1377, 1322. If ever there was a classic American air pistol, it would be this gun. The Crosman 1377C is a powerful multi-pump pneumatic that's been enjoyed by millions of shooters for decades. One of the reasons it's so popular is that it delivers a real wallop, spitting pellets out the muzzle at 600 fps (with 10 pumps). This pistol is suitable for plinking, popping paper targets, hitting spinners and killing tin cans. This pistol comes with a blade front sight and a fully adjustable rear. You can mount a pistol scope or a red dot on it, but you'll need the 459MT intermount. The plastic grip and pump handle are checkered to give you a firm grip. There's even a thumbrest on the grip. With traditional Crosman reliability built into this pistol, you'll be enjoying it for many years to come and passing it along to your children and grandchildren. Carry Strap Minimum Length: 35-1/4"
Carry Strap Maximum Length: 47-1/2"
The Do-All Air Strike Pellet Trap includes hanging metal targets, but may also be used with paper targets that can be properly secured within the front opening dimensions of the trap. 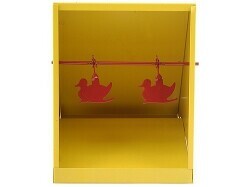 The red targets on the yellow trap make them easy to see so they're easy to shoot! 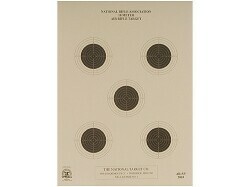 Official NRA targets suitable for scoring matches or for match simulation during practice. This will fit the Do All Trap great for practice at home. The Caldwell Rock Jr. 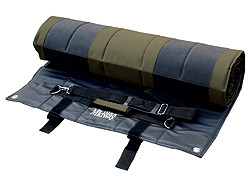 Shooting Rest is packed with many of the features of a premium rest, in a smaller, lightweight package. 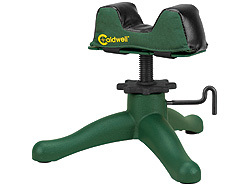 The stable cast iron base features interchangeable feet, non-slip rubber or steel spikes, to allow shooting from almost any surface. Includes a Caldwell Medium Front Bag and works with all universal front bags enabling you to choose a configuration to match your rifle/pistol. The "Y" base pattern adds stability. 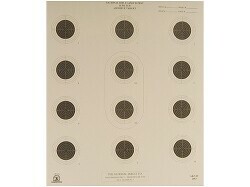 Perfect for sighting-in, test firing and informal competition. 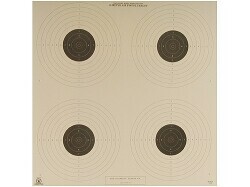 A complete Shooter's Kit for your 177 caliber airgun. Includes: cleaning rod, chamber lube, spring cylinder oil, 177 caliber jag, 177 caliber swab, twenty-five 177 caliber felt cleaning pellets, ten 4" square targets, 250 Meisterkugeln pellets and 250 Superdome pellets. We do not direct drop ship. We are located in PHX, AZ. We will call or email when order arrives.